For many of us, our pets are like members of the family. Scout and Ginger bring us joy and affection while depending on us for proper care and protection. And in today’s busy world, there’s an abundance of online tools to help us keep track of these auxiliary family members and monitor their medical records—and plenty of Web sites that provide paws-on pet information from trusted experts. While the range of tools and resources on the Web is vast, it’s of course no substitute for professional veterinary care. The information and services out there are strictly resources for pet owners—not intended to diagnose or treat any condition. That said, here are some online tools that could help keep Princess purring and Frankie fetching for years to come. If you’re looking for something simple, basic and mobile-friendly, PetVetRecs.com is the way to go. They make your pet’s records available to the right people, at the right time, in the right format, from anywhere. Created by pet owners and animal lovers—who also happen to be savvy developers and designers—PetVetRecs.com helps you access and manage your pet’s health records, while facilitating the transfer of records from one vet to another. It puts you in control of this information—whether you’re at home, at work or on your iPhone (iPhone app is Pet Vet Records). 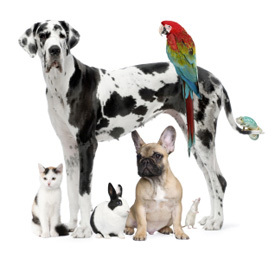 After signing up for a free account, you can add as many pets as you like. 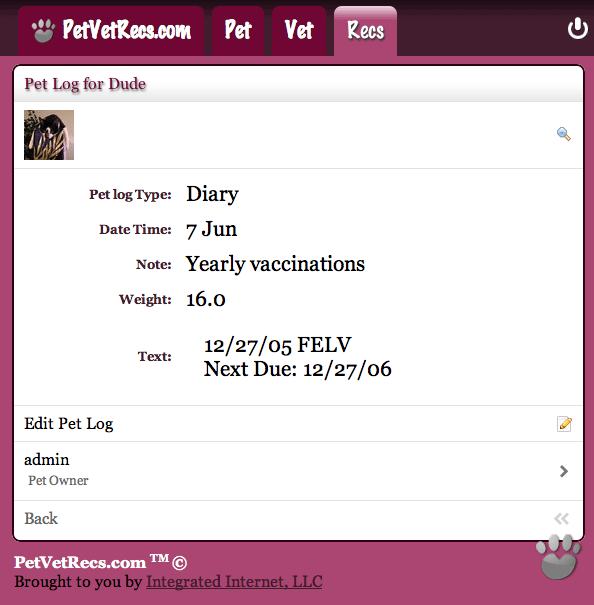 There is a Plogs section (pet logs, of course) for documenting things that happen, or need to happen, with your pet—such as checkups, vaccinations or boarding. By adding “Pet Pals,” you allow others to see your pet's records—useful for veterinarians, boarders or timid dog walkers. For all-inclusive background information, MyPetsFile.com is a great choice. The detailed service allows you to effortlessly access your pet’s health information from any computer or mobile device with a browser, update this info and even get in contact with the vet. Their Pet Health Record (PHR) is a collection of health and medical information—gathered and maintained by you. This may include a list of your pet's medications, supplements, drug and food allergies, vaccinations, conditions, veterinarians, emergency contacts and insurance information. You can also upload important documents and certificates. 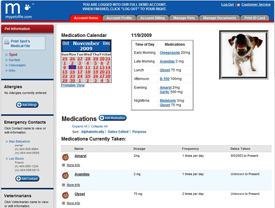 With your authorization, MyPetsFile.com will grant access to this information to anyone you choose, such as veterinarians, animal hospitals, pharmacies, loved ones or boarders. Check out their “demo account” to see what they’re all about. 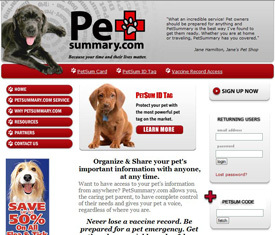 PetSummary.com’s online medical-records system helps you keep your pet safe, regardless of where you are in the world. Their PetSum Card easily communicates basic information about your pet to your veterinarian or pet sitter by putting your pet’s up-to-date information in your hand. This card includes your pet’s picture, medical conditions, allergies, current medications, daily routine and dietary requirements, as well as your and your vet’s contact information. They also have a Vaccine Record, which allows you to store and access your pet’s most current authentic vaccine records online. This could save you serious time when dealing with a kennel, flying, taking a trip to an emergency clinic or changing veterinarians. Their PetSum ID Tag is more accessible than the “microchip” and more thorough than a standard ID tag. The front of the tag provides basic information, while the backside provides a unique code. When the code is entered into the Web site, your pet's finder is provided with as much information as you’ve chosen to share. Great tool resources, just what I was looking for. I have a dogo argentino which is an albino dog (albinos tend to have skin problems more often) who I’ve been taking to several different vets and always losing track of the previous medications we’ve tried (which haven’t worked) so these tools will be helpful for me to keep track and hopefully find the best solution for him.